Easily extended up to three times its retracted height in less than 10 seconds. Extends up to a full 20 feet. A full 2-5/8" in diameter bigger and stronger than most other poles. Telescopes down to 7 feet for easy attachment of flags, portability, and storage. Smooth, "low-friction" action means any adult can work the pole with ease. Exclusive SunSetter patent: Pole sections lock in place automatically when extended -- no need to twist or search for locking holes. Child-resistant lockable collars prevent accidental telescoping of pole. 360-degree rotating collars with flag clips mean flags fly freely, without tangling. A double harness lets you fly two flags at once. Includes a FREE 3 ft. x 5 ft. nylon American Flag with embroidered stars! No hardware to bang noisily against the pole or scratch the finish. No ropes to snarl. Maintenance-free, super-strength 16-gauge aluminum won't rust, never needs painting. Easily installed in a permanent ground sleeve (included). Simple instructions provided. Portable! 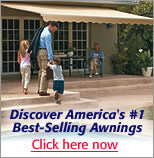 Great for recreational vehicles, tailgate parties, vacation homes, etc. Portable Wheel Stand available for use with RV's or other vehicles.